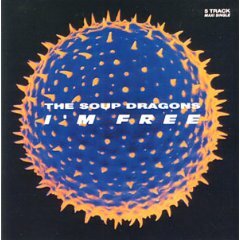 Originally a Rolling Stones track, it was refitted for the early 90’s ‘baggy’ dance/rock scene by Indie stalwarts The Soup Dragons. It got to no.5 in the UK singles chart in July 1990, it was their biggest hit, and they managed one more hit, ‘Mother Universe’, which was off their ‘Lovegod’ album. ‘I’m free’ was added to the album in subsequent reprints. A big happy sound. Enjoy.